Like many other developers, Aristocrat has its own Chinese themed slot machine, and it’s this one, 5 Dragons. The game uses the Chinese dragon as inspiration, and there are indeed five types of such creatures used in certain circumstances, when you wager extra to get the special feature active. The design is probably the game’s weakest part, despite the presence of multiple well done symbols on the reels. 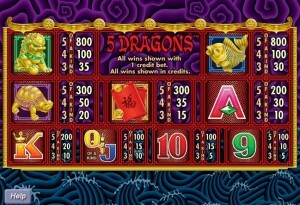 25 bet lines are part of 5 Dragons, a slot machine which comes from Aristocrat. There are some intriguing features inside, especially the free spins where the wilds can bring multipliers of up to 30x. You only get 800x the line bet, so up to $3,200. The game has some features which you get all the time, meaning the wild symbol and the scatter, and then there is the bonus feature which you have to wager extra for and which triggers additional wild symbols. Free spins are also offered by the slot. 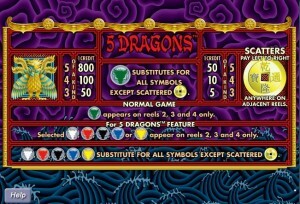 There are six dragon symbols in the game, one for the base game and five for when the special feature is activated. You have to wager on the equivalent of 30 lines instead of 25, if you want those extra symbols. The Dragon wilds come in different colors, with the base game one being green. They are available on the reels 2, 3 and 4 only, so they’re not capable of giving away their own prizes. The Gold Coin scatter icon appears on all the reels and from those positions will award prizes and will also trigger a very interesting free spins feature. You get 5x to 50x the bet when 3 to 5 Gold Coins are scattered on the five reels. Access to the 5 Dragons Feature is obtained with the help of the scattered Gold Coin. 3 or more symbols, going from the leftmost reel to the right, will give you this bonus game. On the next screen, you will find five options, each one with its own governing dragon. The White Dragon free spins give you 20 rounds and that symbol is used as a wild which substitutes and applies multipliers of 5x, 3x or 2x. 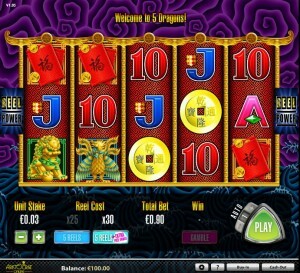 Red Dragon has 15 spins for you, with multipliers being 8x, 5x or 3x when the wild dragon gets involved. 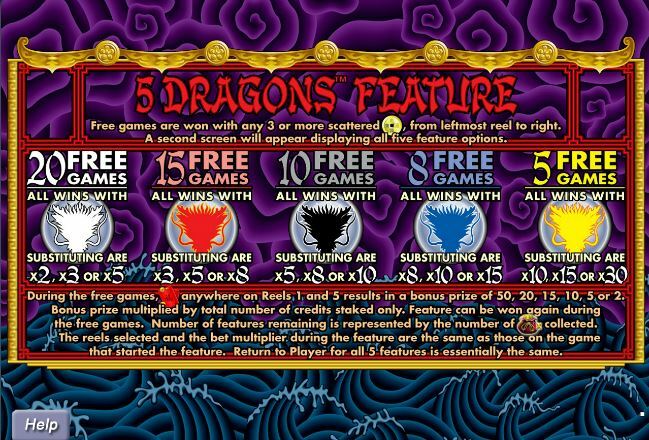 Black Dragon gives you 10 spins for free and 10x, 8x or 5x multipliers from the wild. Blue Dragon will trigger 8 free spins, while the wild applies a multiplier of 15x, 10x or 8x. 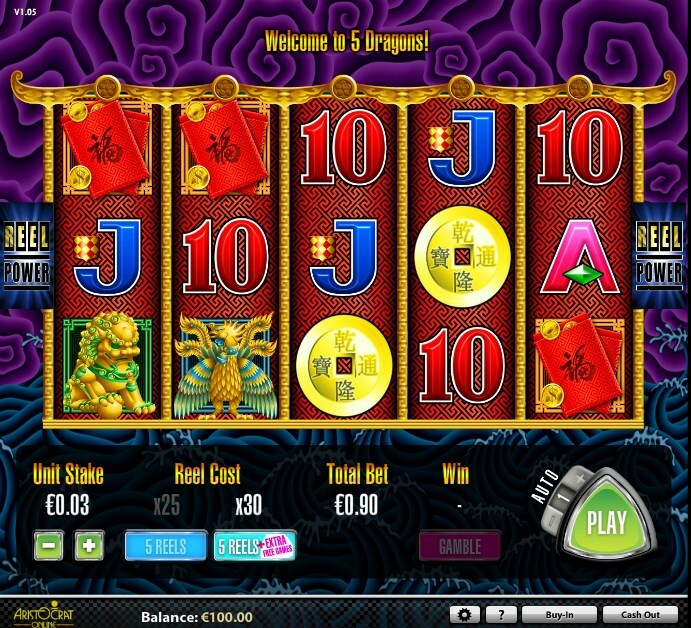 Finally, Yellow Dragon has the smallest number of free spins, 5, but its wild gives you up to 30x multipliers. While the free spins are running, if you get the Red Card symbol scattered on the 1st and 5th reels, you will be rewarded with a payout between 2x and 50x the bet. Placing a bet in 5 Dragons requires that you first decide if you want the extra features active. They will cost you as much as an additional 5 paylines would, so if you use them you have to bet in multiples of 30 coins instead of 25. Between $0.30 and $120 is the range of the wager in this case, with the line bet being up to $4. A 800x top reward, which the paytable advertises, will give you $3,200 at most, but since the wilds of the free spins can have multipliers of up to 30x, things can get a lot better if you’re lucky. The background image is an abstract one, but you can guess that the bottom is supposed to show the ocean’s blue waters, while the purple top represents the sky. Golden arches are placed on top of the reels, with the borders also being made out of the same precious metal. A red and black decorated background is visible on each reel, with good looking themed symbols and some pretty average playing cards. Symbols: Gold Coin (scatter, 50x the bet), Green Dragon (wild), Gold Dragon (800x), Gold Dragon (800x), Gold Fish (800x), Gold Turtle (300x), Red Money Bag (300x), Ace (200x), King (200x), Queen (100x), Jack (100x), 10 (100x) and 9 (100x). You will love the huge multipliers which can appear during the free spins, and you will not even care much that you have to pay extra to get the extra features. 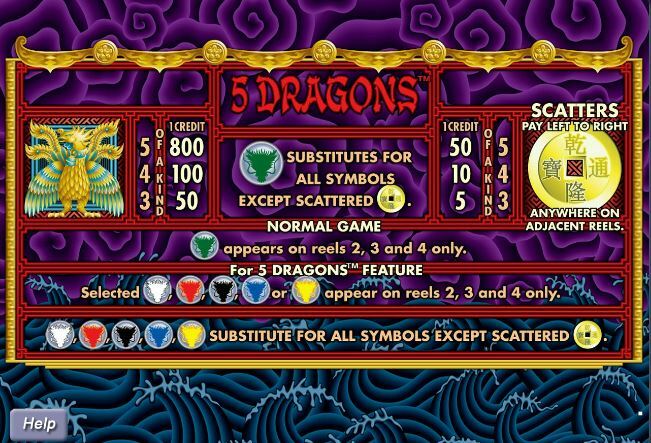 5 Dragons can be found at any Aristocrat casino, where you get a chance to play it for real money or in free mode.